Virtually all of the information fed to the Napoleonic wargamer in the English-speaking world comes from a rather limited point of view, that of the historians and writers whose outlook is often clouded by their inability to read any languages other than French and English. The texts they refer to and quote as 'sources' are sometimes marred by prejudice, arrogance, national chauvinism and a singular dislike of documentary evidence and established fact. Furthermore, it is only rarely indeed that the Napoleonic wargamer gets the opportunity to see the point of view of the other three major participants - Austria, Russia and Prussia - in the wars which he strives so avidly to recreate as accurately as possible in miniature. This short series of articles is intended to make a small start towards filling that vast void of information which is unavailable to those who are unfamiliar with the German language and to provide the wargamer with reliable information on the order-of-battle of the allied army at Jena, its tactics, strategy, an account of the battle and an attempt to analyse the reasons for the allied defeat. This series of articles is based on good, reliable sources, especially the official publications of the French and German general staffs and other well researched works selected for their relative objectivity. A full bibliography will be given at the end of the series. The dramatic victories of the French army over the much vaunted Prussian army and the triumphant march of Napoleon's Legions through Berlin, only a few weeks earlier a centre for anti-French demonstrations by Prussian warmongers, established the Empire of the 'New Franks' as the dominant power in central Europe. The welcome given to the Emperor of France and his army underlined how dramatically events had transformed the political situation. The speed with which this change had occurred cause some to think that the double battle of Jena-Auerstaedt were walk-overs for the French army. Napoleon fostered this view to promote his image of military invincibility and Bonapartist writers have promoted that view ever since. In fact, both battles were hotly contested conflicts with thousands of casualties on each side. They were not easy victories by any means, least of all for the simple soldier who suffered hunger, deprivation, horrific wounds and death as a matter of course. Neither were they one-sided battles, nor was the result a foregone conclusion. Had the allies brought their superior numbers into play at Auerstaedt, then even a general as skilful and able as Davout would surely have suffered a defeat. Likewise, at one stage of the Battle of Jena, the Prussians felt that they had victory in their grasp, but weight of numbers and better handling of the reserves on the French side eventually told. The heroism of the allied forces drifted away in the dust of the retreat, being forgotten in the panic and overshadowed by the shameful capitulations of fortresses that followed in the wake of the vigorous pursuit by the victorious French forces. have caused such grievous losses." (Etudes Tactiques, pp.368). 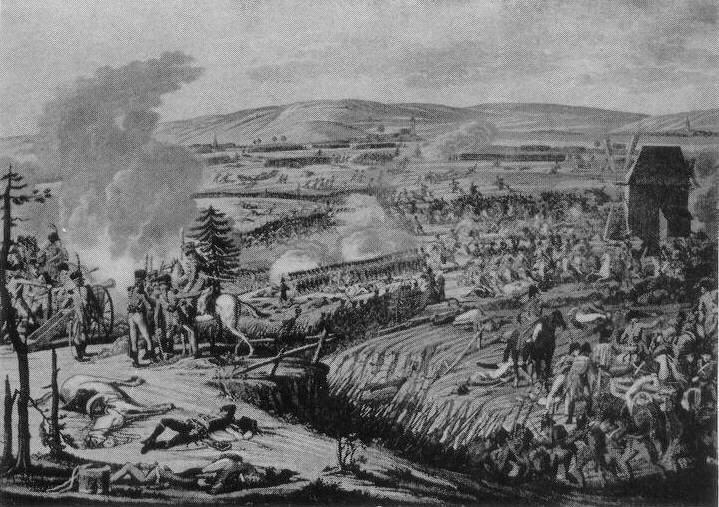 Jena is often described as a 'Prussian' defeat, yet an analysis of the composition of the Prusso-Saxon forces at this battle shows that it was almost as much a Saxon defeat as a Prussian, although that is not to deny the fact that both contingents fought with great valour in very disfavourable circumstances. their hats." (Massenbach's Memoirs, Vol. 3, pp.37 ff). Added to the command problems faced by the Prussians was the fact that they were allied with the Saxons and a number of brigades and divisions contained a mixture of troops from the armies of both allies. This is where the French had their greatest tactical advantage over the allies - their divisions were led by experienced generals. August Ludwigs vom der Marwitz. Vol. 2, pp.62). These forces consisted of one corps under General Count Tauentzien, who commanded the IV Corps in 1813, the 2nd Division under Lieutenant-General von Niesemeuschel, the Saxon Cavalry, a Detachment of light troops under Colonel von Boguslawsky, the Brigade Dyherrn, the 1st Division under Lieutenant-General von Grawert, later commander of the Prussian Auxiliary Corps in Russia in 1812, the Saxon New Brigade Cerrini, the Prussian Cavalry, a Detachment under Kollin, another under Lieutenant-General von Holtzendorff positioned in Lehestein, four battalions in Capellendorf and one on its own from Erfurt. This force was later joined by the Corps under Lieutenant-General von Ruechel. Niesemeuschel's Saxon Division, situated on the right of the allied position, consisted of two brigades, the 1st under Major-General von Burgsdorf, the 2nd under Colonel von Nehrhof. 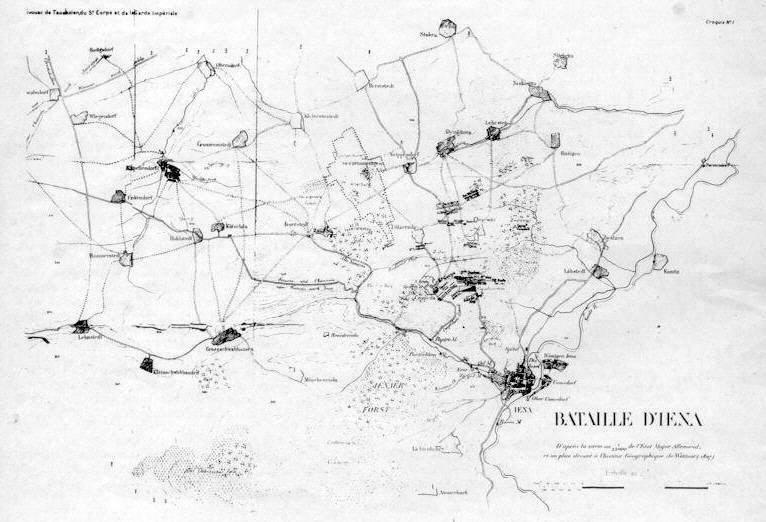 Brigade Dyherrn, initially placed towards the rear, later plugged the gap between the 1st and 2nd Divisions. Furthermore, there were five squadrons of Saxon Hussars in Liebstadt. They never participated in the battle. 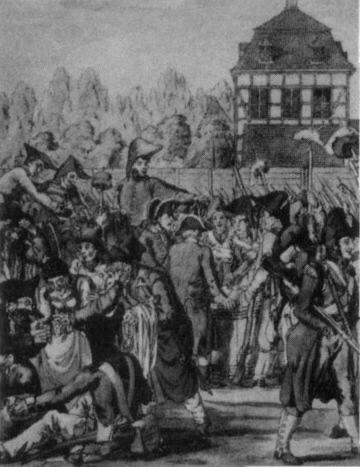 French soldiers in the suburbs of Leipzig after the battle of Jena - a meat ration is being distributed and looted items are on sale. (Contemporary picture). Under General von Wobeser in or near Weimar. Total allied strength 53,015 men. * These battalions fought in two ranks. A new battalion was formed from the men of the 3rd rank. These battalions are therefore counted as 2/3 battalion. The musketeer battalions consisted of five companies each of two platoons, drawn up in three ranks. The grenadier battalions consisted of four companies, each of two platoons drawn up in three ranks. The fusilier and Jaeger battalions were also of four companies with each of the eight platoons fighting in two ranks. The line regiments were named after their colonels-in-chief, the grenadier and fusilier battalions by their actual commanders. The Jaeger companies were usually detached and were also named after their commanders. The musketeer and grenadier companies each had ten rifle-armed skirmishers known as 'Schuetzen'. They were commanded by a selected NCO. When the entire battalion's skirmishers were deployed, they were joined by an officer and bugler. According to the Cabinet-Order of 21st July 1806, each fusilier company was to increase the number of its 'Schuetzen' to 22 men, but there is some doubt if this was universally accomplished in time for the outbreak of war. The dragoons, cuirassiers and hussars were armed with a sword, a brace of pistols and a smoothbore carbine. Each squadron had ten men (in the hussars twelve) armed with rifled carbines. 7pd howitzer battery - 8 7pd howitzers. A Saxon infantry regiment consisted of ten companies, eight of musketeers, organised into two battalions, and two of grenadiers, amalgamated in wartime with those of another regiment to form a battalion. 32 officers, 8 sergeants, 8 ensigns, 8 quartermasters, 8 surgeons, 40 corporals, 8 trumpeters, 8 smiths and 600 privates. 24 officers, 8 comets, 16 sergeants, 8 ensigns, 8 quartermasters, 8 surgeons, 80 corporals, 8 trumpeters, 8 smiths and 880 hussars. The Saxons used eight and twelve pounder cannon in their field batteries along with four pound 'grenade pieces' and eight pound howitzers. Four pounder cannon were used by the infantry regiments. Part 2 will cover the tactics used by the allied armies. 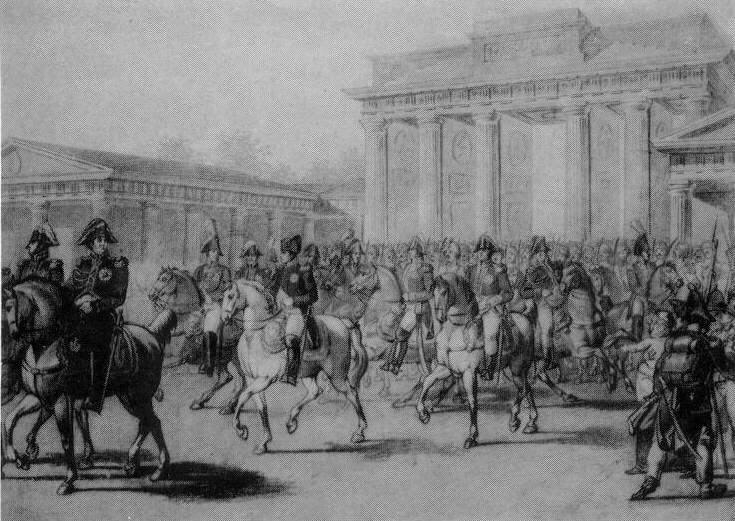 Napoleon's triumphant entry into Berlin, 27th October 1806.